For the last six months, you may have noticed that some of your favorite apps on Facebook Platform carried a special badge deeming them to be “Facebook Verified”. These apps “passed Facebook’s review for trustworthy user experiences”, and were given both greater exposure in the App Directory and less restrictive limits on the number of messages they could send to users. And tomorrow, just over six months after the program launched, Facebook is killing off Verified Apps for good. This shouldn’t come as a surprise: Facebook announced plans to end the program in late October, and has been Emailing developers about it for weeks. But now that Verified Apps are going away, it’s a good time to look back at the long, convoluted road Facebook took to a program that was ultimately very shortlived. The Verified Apps program has been anything but a smooth ride for developers. It was first announced at the Facebook developer conference in July 2008, with the intention of helping users identify the most trustworthy apps on the platform. In return for meeting Facebook’s guidelines, apps would be rewarded with bonuses like advertising credits and relaxed rules on how many notifications and messages they could send to users. More concrete details about the program were revealed the following November, when Facebook opened up the program to applications. Developers were charged a $375 fee to apply, which we likened to a protection racket. But after developers paid their money, Facebook went silent about the program for half a year. That understandably led to growing developer unrest. 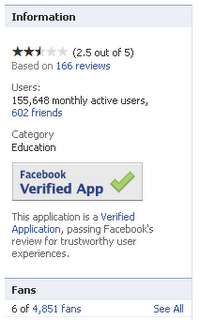 Finally, nearly a year after it was first announced, Verified Apps made its debut in May 2009. But Verified Apps was only supposed to be a stepping stone to the site’s true cream of the crop. The most elite class of applications was to be called “Great Apps”, and launched with iLike and Causes as inaugural members. But that was another false start. Two months after the launch of Verified Apps, Facebook revealed that it was canceling its plans for its Great Apps program and demoting current members to regular Verified Apps. Or, as Facebook put it, they were getting rolled into the same thing, so Verified Apps were getting the benefits that would have been reserved for Great Apps. Despite these logistical hurdles, developers certainly benefited from the program. For example, CampusBuddy, a verified app we covered in September, has grown from 60,000 to over 150,000 monthly active users. CEO Michael Moradian says that the company will especially miss the “extra boosts” that applications received as part of the program because they helped virality. But while CampusBuddy would have liked to see the program continue, Moradian acknowledges that times may be changing. You can see his blog about the news here. 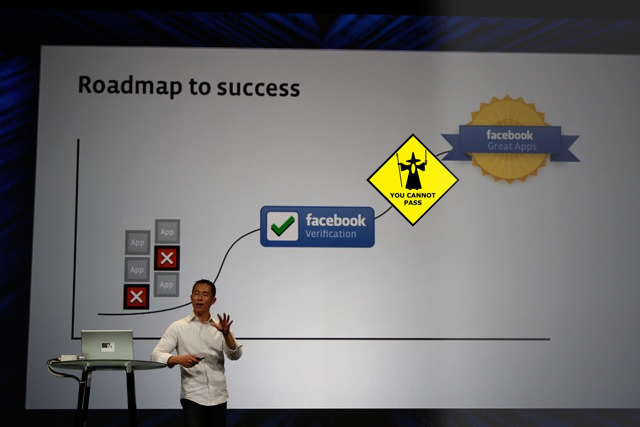 We are standardizing the idea of verification to apply to all of the applications on Facebook Platform. We are evolving the program to improve the overall user experience and ensure that applications on Facebook Platform meet verification standards. We intend to make sure that the experience that our users have on Platform is of the same quality as they experience elsewhere on Facebook, which is something that we are constantly asked for by developers. In other words, Facebook wants every app to be trustworthy. To do that, they’re planning “to expand [the] team responsible for policy enforcement on Platform so that they can support the upholding of the principles we’ve introduced as part of our roadmap.” It’s not really clear why they wouldn’t have done this from the start. The timing is certainly interesting. Some of the companies we called out in our ScamVille posts for using scammy offers, like Zynga, have some of their apps Verified. Granted, Facebook announced the decision to end Verified Apps a few days before we first broke the Scamville story, but they’ve been aware of the infringing games, offers, and ads for a long time. In effect, they’ve been stamping their seal of approval on games using tactics that are the target of a class-action lawsuit.